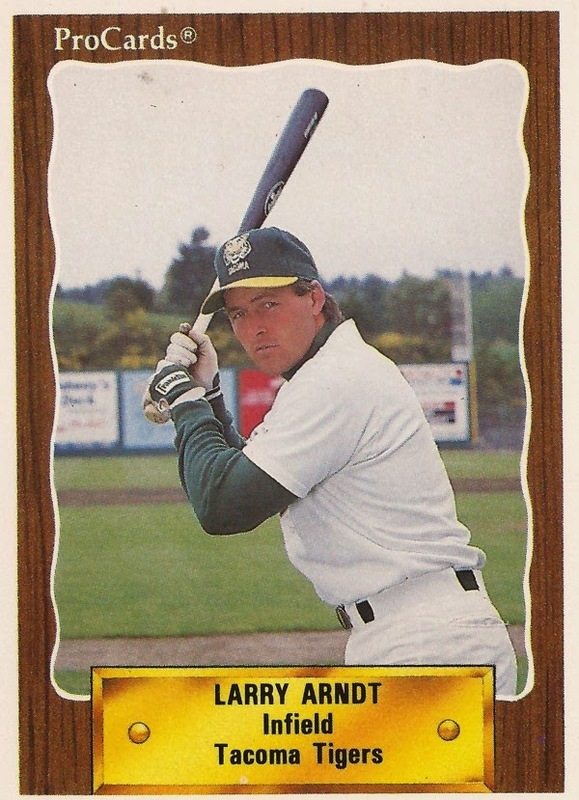 Called up to Oakland in June 1989, Larry Arndt got into two games, getting one hit in six at bats. He also scored a run. They were the married, father of two's first two major league games, called up from AAA Tacoma days earlier in his fifth season as a pro. "I've worked a long time and struggled with the family for a long time to get here," Arndt told The Modesto Bee. "Now that I'm here, I just want to enjoy it. If I stick, great. If I don't, I'll work as hard as I can to get back up here." However hard he worked, for Arndt, his major league career was already over. Arndt played just those two games with Oakland that month. Sent back down to Tacoma, he never returned to the bigs. Arndt's career began in 1985, taken by the Athletics in the 26th round of the draft, out of Bowling Green State University in Ohio. At Bowling Green, Arndt left school in 1985 as the team's career leader in RBI. He also won first-team all-conference honors in 1984 and second-team in 1985, according to BGSUsports.com. A decade after he left, Arndt was inducted into the school's Hall of Fame. Arndt started his pro career at short-season Medford, hitting .289 in 69 games. He hit six home runs and knocked in 48. In his second season, in 1986, Arndt played at single-A Madison, hitting .281, with 16 home runs. He made AA Huntsville in 1987, his average dropping to .244. He made AAA Tacoma for the first time in 1988, playing much of the season there and hitting .273. Arndt started 1989 back at Tacoma. In June, he got his call to Oakland. In his first game, June 6 against the Twins, Arndt went 0 for 2. In his second game, Arndt went 1 for 4, scoring on that one trip to the base paths. Then his major league career ended. Arndt played out the season at AAA Tacoma, hitting .280 on the year. He returned for just one more season, playing back at Tacoma. In January 1991, Oakland traded Arndt to the Indians for Troy Neel. Arndt, though, isn't recorded as playing again. Arndt passed away in January 2014 at the age of 50.